The holidays are one of the most festive, and therefore, most decorated times of year. It is during this brief period of time that we literally deck the halls with as many lights and decorations as we can stand. Unfortunately, the holiday season is also one of the busiest for firefighters. All the beautiful lights that you string across your home can also present a serious electrical hazard if the proper precautions are not taken. Before flipping the switch and showing off your hard work, make sure you have followed a few simple electrical safety tips and precautions. This will not only ensure that you remain safe from electrical shocks and fire, but also that your lighting display is built to last. If you use a real Christmas tree, make sure that you keep it watered the entire time that it is inside your home. When dry, these trees can go up in flames in seconds. By keeping it watered, you preserve its fresh look while reducing your chance of it becoming ignited by an electrical short or excessive heat. Before placing lights on your home, check each strand thoroughly for any damaged cords, frayed ends or loose connections. If you have older lights that do not have fused plugs, replace your old strings with new ones. Fused plugs add an additional layer of safety by preventing sparks in the event of a short circuit. 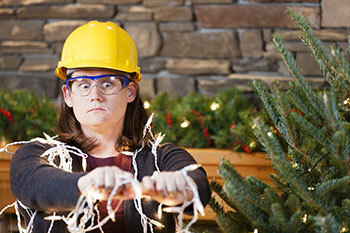 To avoid any unwanted damage to your holiday lights during storage, store them in a tightly sealed container. This will help prevent any damage from water or rodents. Make sure that you replace all burned out bulbs with a bulb of the correct wattage. Never use tacks, nails or screws to hold your lights in place. Instead, use insulated hooks that will help prevent shorts. Elevate the plugs of any cords that are running across the ground. This will help keep them free of snow, water and debris that could cause damage and shorts. If you must run any extension cords across the ground, tape them in place to prevent people from tripping over them. When people trip over the cord, it not only presents an immediate falling danger, but also an increase in wear on your extension cord. Only buy lights that have been laboratory tested. You can typically find the UL listing on the outside of the box. This ensures that the lights have passed rigorous safety and performance standards. Always check the recommended usage for your lights. This means only using indoor lights for inside use and outdoor lights for outside use. Many of today’s lights are rated for both indoor and outdoor usage. Indoor only lights, however, have thinner insulation that is more easily damaged when exposed to the elements. Always turn off your lights whenever you are sleeping or not at home. Avoid overloading electrical circuits. This can lead to overheating and tripped breakers. Plug all outdoor lights into a ground fault circuit interrupter (GFCI) outlet. These outlets are designed to shut off the flow of power whenever a short is detected. As a result of haphazard installation and ignoring many basic safety rules, the holidays often result in more fires than there normally are. This fact should not, however, stop you from decorating your home the way that you want to. With a little holiday electrical safety planning and following the above electrical safety tips and using a little common sense, you can avoid almost all electrical fires. So be festive and decorate well, but make sure you do it safely so that you can enjoy your display for years to come. Top notch. Shows up when he says he will, performs work requested, completes it on time and on budget.